Shirdi Sai Baba Stories,Leelas and Teachings. : Sai Baba blessed me on my Birthday-Experience by Avinash Kaur. Sai Baba blessed me on my Birthday-Experience by Avinash Kaur. Wish you a very Happy Guru Nanak Jayanti.May Guru's blessing be on one and all. I am very happy today to share experience by Avinash Kaur with a small experience I witnessed while I worked on this post. Generally I do not do computer on Sunday and do not check my mails. But I had to do some search on net and so logged to my mail. I found mail from Avinash requesting if her experience can be shared on Guru Nanak Dev's Jayanti with a picture where Guru Nanak ji and Sai Baba are together . 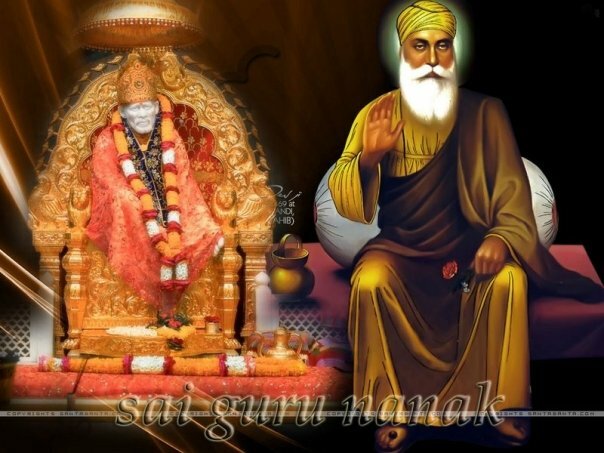 I was unaware that today is Guru Nanak ji's Jayanti and neither I was sure if I had wallpaper of both Guru's together .Seeking blessing from both Guru I started my work . I searched my folder ,it is so vast that it was taking lot of time to find .I knew I had 1-2 picture of both Guru together but I was unable to locate in thousands of pictures in the folder.Than I was reminded of Brother Rahul(many wallpaper are already uploaded in all 4 website created by him) who has lot of picture of Baba with different theme so I searched His folder and immediately got one .The picture is uploaded here just above the post . I know this appears to be a very normal event but if we closely look at it ,it is directly guided by the Guru's ,as blessing to the devotee who earned and longed that her Sai Leela be shared to one and all on this auspicious day and be a blessing to her as well. Jai Sai Guru Nanak Dev. 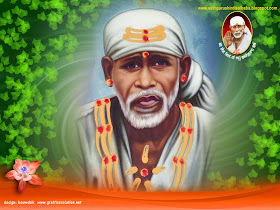 I am regular visitor of your website but I never share any experience.Today, I want to share my experience with you.If you can share it on your website then I will think that Baba blessed me again.I got many experiences with Sai baba and I am sharing one of my experience with you which happened yesterday.I am sharing the experience first time so it is my request to you that If you find any mistake please correct it.Thankyou so much. 1st Experience :- Sai baba ji & Guru Nanak dev ji is same. I am a sikh girl and devotee of Gurunanak Dev ji and Sai Baba but I feel that Sai Baba is very close to my heart.He always forgive my mistakes.I was wishing to visit Sai Baba temple,Rohini at Delhi for 2 years but could not go there.18 November,( Thursday ) It was my birthday & Sai Baba called me in their temple which is situated in Rohini at Delhi.My wish got fulfilled to go there on my birthday.I was very happy because it was Thursday & my birthday also. When I went there I took a basket to offer Sai Baba which includes Yello colour cloth for Baba & some flowers.I gave it to preist and seeked for blessings to my Sai Baba.Then preist returned back the basket with a saffron colour cloth to me .I felt very good.When I was going outside the temple to return home.I decided to buy some beautifull clothes for Sai Baba pratima which I have at my home.I noticed that chandan is there in the shop so then I told the shopkeeper to pack some chandan also.I wanted to mention that few days back I was reading Sai Satcharitra in which 'a devotee apply some chandan on Sai Baba's forhead to meditate his family Guru(ishtdev) & Baba accept it'. But then I got a thought that Gurunanak dev ji does not apply chandan or sikh people do not offer chandan to their guru and forgot about that thought when i left the shop.When I returned home from temple I opened the packet and found that chandan was not there in the packet . Later I also noticed that priest had returned me a saffron colour cloth with the Blessings of baba.I felt very much blessed because in Guruduwara, sometimes the preist give saffron colour cloth to people who bow there.I understoodd that Sai baba showed me that Sai baba & Gurunanak Baba is same.He blessed me with Saffron colour cloth and he made the shopkeeper forgot to keep the chandan as per to my thought later that chandan is not applied by sikh to their Guru.What can one ask for more....it was a pure blessing of Baba on my birthday and I felt very happy and blessed. 2nd Experience :- Sai Baba gave me a beautifull gift. On my birthday, In the morning I was lighting Incense stick (dhoop) in front of Baba and I was expecting a gift from Baba,Ithink in heart of heart each one seek Baba's grace in some or the other form on our special days so did I. In the evening when I went to Sai Baba temple,Rohini.My fiance was with me and he gifted me a beautifull Shirdi Sai Baba Samadhi mandir photo.I was thrilled to have Baba in this form come to me on my birthday from the special person .I am sure Sai Baba gave me this photo as a blessing on my birthday as His gift.What more could i ask for from Baba. My day was made and I felt the blessing . Shri Sachidananad Sadguru Sainath Maharaj Ki Jai.